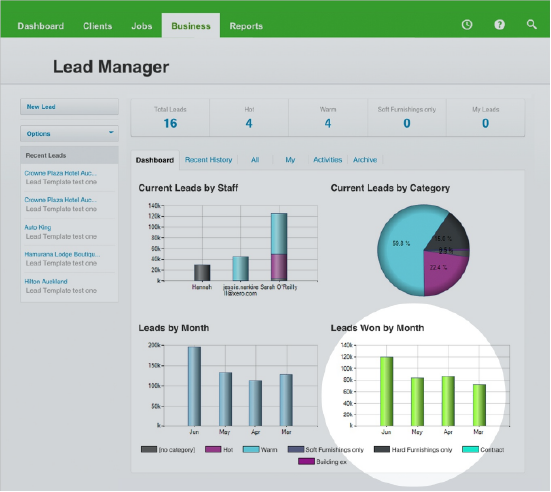 Track your leads, proposals and sales pipeline from one place. 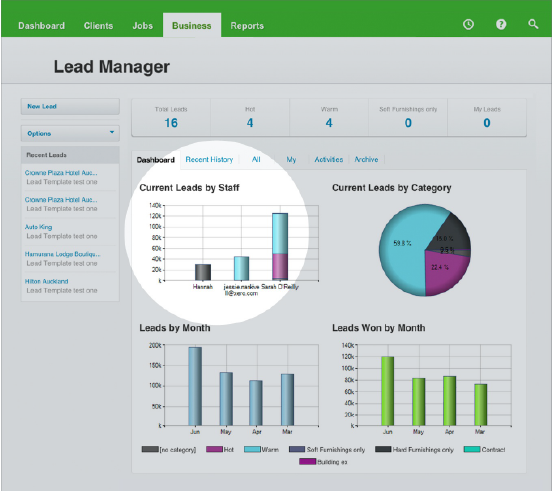 Get a high level overview of your sales pipeline from the Dashboard. Find out who is bringing in the most business. Add specific lead activities to certain staff members and ensure these are ticked off when completed. 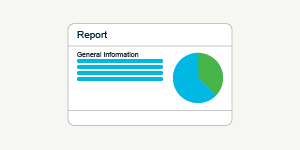 Group leads by category and get an overview of lead status, represented visually. Track your business from month to month and see results that really matter. Enter as many details as possible on the client and nature of work. See a history of lead activity – so if the lead needs to be picked up by another staff member, or in a few weeks time, it’s easy to tell exactly what activity has taken place. 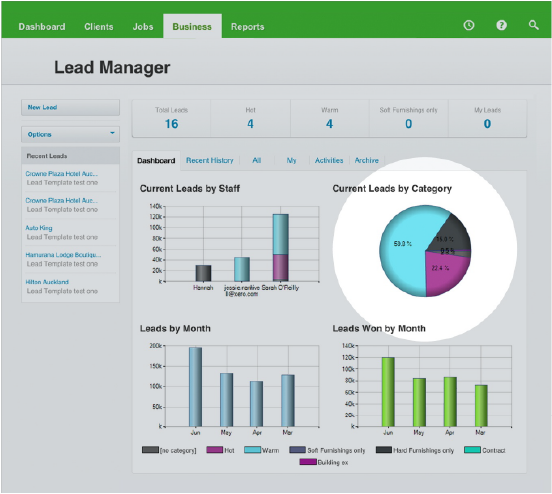 Enter all the details into the lead management software. Mark your lead as ‘won’ and flip your quote or estimate to be a job template. Assign your staff, add in your schedule and close your sales loop. When the job is finished, generate an invoice and get paid quickly. Access your lead information anywhere, anytime. Get an overview of what stage your leads are at and know exactly when to follow-up. Get a visual overview of what stage your leads are at and know exactly when to follow-up so you can convert them quickly! Follow up emails, quotes, notes - all get cc’d into the unique lead email address so you can pick up right where you left off. Spend time on only your most qualified leads. Set notifications and never forget to follow up with a hot prospect! Use lead templates for prospects that require a similar pattern of follow up, with pre determined activities that will make the process faster. In just a few clicks you can turn prospects into projects! Enter lead information once and it flows through the entire process. 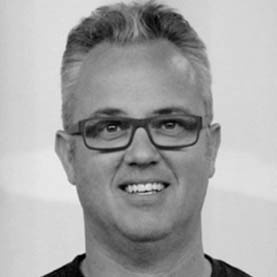 "Quoting is one of the coolest features of WorkflowMax. If somebody calls me and tells me he wants a website, I can send a quote while he’s still on the phone. I’ll go to templates, type the name in, adjust some figures, & bam!" I’m not sure which invoicing option is better for my business – based on a quoted amount, or based on actual time or costs? You sure can! WorkflowMax lets you customise your invoice. Use Custom Templates to create beautiful invoices that reflect your brand. In my business we sometimes need to send invoices as we go...Is this possible in WorkflowMax? It sure is. You can create multiple progress invoices when you need to invoice a client for ongoing work on a job. We invoice our progress every month e.g. 70% one month then the remaining 30% in the following month. Can this be achieved with WorkflowMax? Yes it sure can! If you have created a quote for the project, you can issue a progress invoice as a percentage of the quoted value as you go. Keep track of your uninvoiced 'Work-In-Progress' (WIP) from the financial tab of the job or under Business and “Work in Progress”. ! 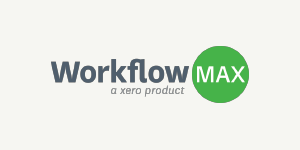 We send out invoices for work regularly, can we automate this in WorkflowMax? 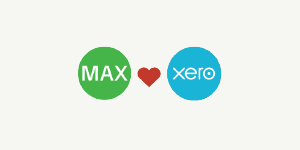 Currently – if you’ve chosen to integrate your WorkflowMax account with Xero – you can set up recurring invoices in Xero and import this manually into recurring jobs in WorkflowMax. If you upgrade to Workflowmax Premium, as long as the references matchup, invoices can automatically flow back from Xero to the respective jobs. For more information contact one of our product specialists and they’ll be happy to help! 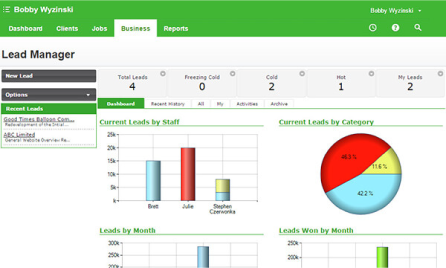 Quickly and easily uncover inefficiencies and see where you can improve your business.